WPBeginner» Blog» Beginners Guide» What is an XML Sitemap? How to Create a Sitemap in WordPress? Back in early 2000s, government websites used to have a link on their main pages, titled “Sitemap”. This page usually contained a list of all the pages on that website. Even today some websites have such HTML sitemaps. However, sitemaps have evolved so much from the manually created HTML bulleted list. Today sitemaps are published in XML instead of HTML and their target audience is search engines and not people. Recently one of our users sent us an email asking us: what is a WordPress sitemap? Do I need to have a sitemap on my site? How can I create a sitemap in WordPress? If you are new to WordPress and had the same questions, then you are at the right place. In this article we will explain what is a sitemap, why you need a sitemap, how to create a sitemap in WordPress, and how to tell search engines about your sitemaps. Sitemap is a list of pages on a website that is accessible to all users. An XML sitemap is a way for website owners to tell search engines about all the pages that exist on their website. WordPress XML sitemap also tells search engines which links on your website are more important than others and how frequently you update your website. While sitemaps do not boost your search rankings, it allows search engines to better crawl your website. From a Search Engine Optimization (SEO) point of view sitemaps are extremely important. First we would like to clearly state that adding a sitemap does not affect search rankings. However, if there is some page on your site that is not indexed, then sitemap provide you a way to let search engines know about that page, so it can be indexed properly. 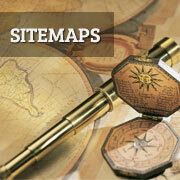 Sitemaps are very useful for new websites and blogs. As most new blogs usually don’t get many backlinks to their individual posts, it becomes harder for search engines to discover all of their posts and pages. Sitemaps allow those websites to help search engines crawl their sites more efficiently. For popular websites, sitemaps allow your website to interact with search engines more effectively. Search engines can guess how often your site is updated, which parts of your website are more frequently updated than others, set crawl rate for your site, etc. This improves the overall visibility of your site to search engines. There are several ways to create an XML sitemap in WordPress. At WPBeginner, we use Yoast’s WordPress SEO plugin to generate our sitemaps. We use this plugin because it allows us to optimize our blog posts along with offering other features such as sitemaps, social integration, and more. We have also noticed that it works more efficnelty than other standalone sitemap generators for WordPress. Lastly, it also offers custom sitemaps like the Video Sitemap. To add a sitemap to your WordPress site, first thing you need to do is install and activate WordPress SEO by Yoast plugin. By default, WordPress SEO does not enable XML sitemap functionality, so you will have to turn it on. To do that go to SEO » XML Sitemaps and check the box to enable XML sitemap functionality. 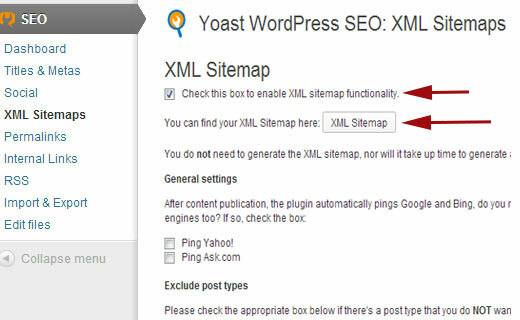 When you check the box to enable XML sitemap functionality, WordPress SEO will show you a number of options that you can configure for your Sitemaps. If you are unsure about what to do with them, then ignore them and click on Save settings. Now your sitemaps are generated and publicly accessible. WordPress SEO will show a XML Sitemap button which you can click to view your sitemap_index.xml sitemap. How to Tell Search Engines About Sitemaps? Search engines are quite smart in finding a sitemap. Whenever you publish new content a ping is sent to Google and Bing to inform them about changes in your sitemap. However, we recommend that you submit your sitemap to Google by using Google Webmaster tools. The benefit of this is that Google will now show you any errors, pages indexed, and other relevant stats that will be helpful to you as a webmaster. Go to Google Webmaster Tools. If you are not already signed in to your Google account, then you will be asked to sign in. After signing in you will reach webmaster tools. There you will see “Add a site” button, click it and then add the URL of your website. On the next screen you will be asked to verify the ownership of the website you are trying to add. There are several methods to do that. But since you are already using WordPress SEO plugin, then the easiest method for you is to copy the HTML Meta tag value and paste it in WordPress SEO plugin. To do that click on Alternate methods and then on HTML Tag. You will then see a line of HTML Meta tag code. Copy and paste this line in a text editor like notepad. Now copy the value inside the content=””. Leave the webmaster tools site verification page open because we will come back to the page after adding the meta tag to verify the ownership of the website. Go to your WordPress admin area and then click on SEO tab. This will take you to WordPress SEO plugin’s dashboard. Scroll down, and you will see Webmaster Tools heading. 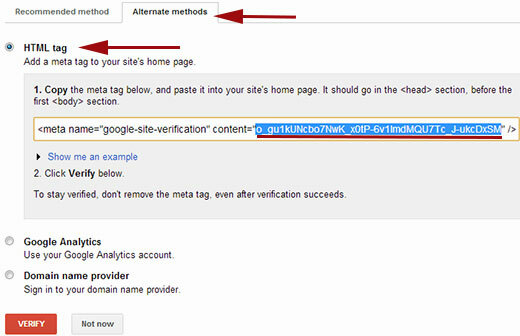 Paste the meta tag value you copied next to Google Webmaster tools and Save Settings. Go back to Google webmaster tools, site verification screen and press the verify button. You will see a notice like “Congratulations you have successfully verified your ownership of www.yoursite.com”. Click continue to see webmaster tools dashboard for your site. On the next screen you will see Sitemaps column with no sitemaps in it. Clicking on it will take you to a Sitemaps page where you can add your sitemaps. Click on the red button labeled “Add/Test Sitemap” and provide the URL of your sitemap. Yoasts WordPress SEO plugin publishes multiple sitemaps for your WordPress site. The main sitemap is sitemap_index.xml which contains link to your other sitemaps. You can either submit sitemap_index.xml alone or submit all other sitemaps one by one. We recommend submitting sitemap_index.xml alone, Google will then automatically discover other sitemaps and crawl them. Once you have successfully added your sitemap, it will appear as pending. It will take Google sometime to crawl your website. After a while you would be able to see some stats about your sitemap. It will show you the number of links it found in your sitemap, how many of them got indexed, a ratio of images and web pages, etc. Visit Google Webmaster tools often, at least once a month. As your site gets older you will start seeing more and more useful data about your website and how it is seen by the search engine. This information can help you learn how well your site is doing and what other things you can do to improve its performance in search engines. We hope that it answered all the related questions like what is an XML sitemap, what are the benefits of a sitemap, how to create a sitemap in WordPress, and more. If you have any questions, or noticed that we missed something, then please leave a comment below. I have Yoast SEO but XML sitemaps does not appear on the menu, which indeed looks very different from yours. Any suggestions as to how to find it? Thanks – got it now. how do I change sitemap format, please? If you’re using a caching plugin you may want to try to disable it to see if it could be a conflict between Yoast and the caching plugin you’re using. Hi, awesome tutorial, I did same as your instruction and working fine. But there’s a problem with this, check out the details. my website is yahoonewsz.com and when I type “www.example.com/sitemap_index.xml”, it works fine but it says page not found when typed “example.com/sitemap_index.xml”. Thanks for your best tutorial! I recently have a wordpress blog and have created xml sitemap using yoast seo, according to this tutorial in previous month. Yesterday I happend to see my xmlsitemap file at my wp-admin. There are only 5-6 lines which covers my new posts only. What about my old posts? Is there any problem? And how come I know that there is any problem? Because I have more than dozen posts till now. You may want to clear your caching and reach out to Yoast if your sitemap is refusing to update your older posts if you’re not excluding them. I am using All in One SEO pack Plugin. If I download Yoast’s WordPress SEO plugin should I use both? No, we would not recommend having multiple SEO plugins active as they can conflict with each other. one thing I want to know is that whether after every single update in pages, posts or change within a post, we need to submit the sitemap??? You should not need to resubmit your sitemap as long as Google does not run into any errors with your sitemap and with the method from our article it should over time update your sitemap. Please guide me to make a news sitemap for google news submission. In my website, I generated sitemap using this tutorial, however I want to remove one particular non-existent URL from the sitemap as it’s giving 404 error and google adsense is showing crawl error. How do I remove one particualr URL from sitemap and ask google to stop crawling that URL? I see some websites have multiple sitemaps. Is it really necessary? is sitemaps still relevant in 2018? My site has been verified but can’t find site map near to it .What to do for it ? I did your step for the sitemap. Awesome! Also, for my robots.txt file I have the following, should I change that first line of sitemap to what yoast says? I am not even sure where I got that old sitemap from but don’t want to mess anything up. Yes, if you are using Yoast SEO, then you should add Yoast SEO sitemap. I want to ask if it is okay to submit my site to other webmasters like bing, yandex and others. I can’t find my sitemap code in yoast. which social plugin do you use to show the number of shares? Yoast SEO must have been updated because the check boxes are now sliders – at least on my site. When I enable the stiemap function, then click the link to view the site map, I get a 404 Not Found error. Did I do something wrong? Really helpful article! I have just having trouble when it comes to viewing my site map, it’s coming up with 404 error and I’m not sure why? 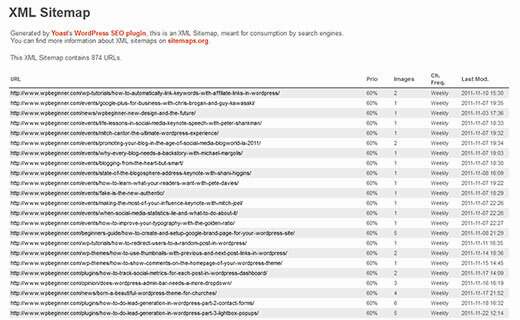 Hey, there’s nothing like SEO>XML Sitemap in my WP dashboard. Does this feature work on the Premium version of Yoast SEO only? Please help! It works with free version as well. You will need to enable ‘Advanced settings pages’. Go to SEO » Dashboard page and then click on ‘Features’ tab. Scroll down to Advanced settings page section and click to enable them. Don’t forget to click on the save changes button. After reload you will see new menu items in under SEO menu. Hope this helps. Hello, I still cant see the xml sitemap on my Wp dashboard. Having the same exact problem. This option does not appear anywhere on my wordpress dashboard. Were you able to get any help with this? there is not sitemap option, please help, in fact if i go on “mysite.com/sitemap_index.xml” there i can find the sitemap but settings are not in my dashboard. Under SEO > General > Features, down by where it says XML Sitemaps, click on the question mark to expand some text. Click on See the SML sitemap. Then, you can add the URL for your sitemap to the Google Search Console. UPHOARIA, not all heroes wear capes, my friend. Thank you!!! After an hour of trying to figure this out, this was immensely helpful! after implying the details as clearly elaborated in the blog within a month i saw the changes in my rankings this trick works no hassle. there is a great improvement in my SEO optimization ranking. Thank you for putting this up nicely, i have one question though for which i need help. If once i have submitted a sitemap to google and i also have my yoast SEO completely configured, then on adding new content will yoast only update the sitemap or will it automatically submit it to google as well? Or is it that i should submit the sitemap manually to google every time there is new content. The sitemap generated by Yoast SEO automatically updates itself. You only need to submit your sitemap to Google once. However, if you move your website to a new address, then you will need to resubmit your sitemap. A site map is a kind of interactive table of contents, in which each listed item links directly to its counterpart sections of the Web site. My sitemap only shows the homepage, and not the 29 other pages of my website. Any ideas on how I can solve this? Great post for beginners. Thanks. My Yoast Seo XML Sitemaps won’t work with google search console. A big thanks, guys! This guide helped me through. Thank you so much for your instructions. it was very useful for me.i did all steps and i could put my site map on webmaster tool and also my blog pages only because of your helpful article. I just added my site map to Google. Hello, thank you for the detailed article, finally I understood how it works! Try adding your website without www prefix. Google treats www and non-www as two separate domains. HI to wpbeginner team. 1st of all thank you for your excellent work and helping beginner in such a great way. I am using All in one Seo and came to know you use for your sites Yoast Seo. Can you guide me how do I shift to Yoast without messing up my sure?? Yoast SEO actually has a tool inside the plugin that will help you migrate. i am trying to create sitemap and i created a lot of sitemap using different plugins but when i click on sitemap it says nothing found. 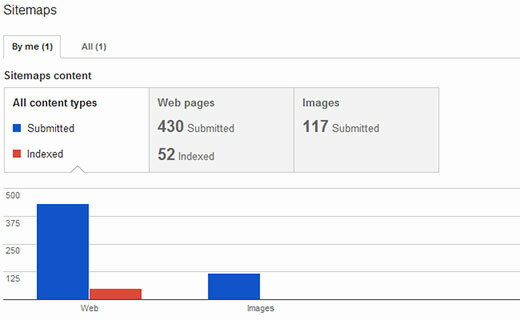 Under sitemaps, for webpages, it’s saying 104 were submitted, but only 14 were indexed. Yoast SEO gave me 3 sitemaps which I added. How xml sitemap will show to user? Great! Thank you for this tutorial! I’m having lots of duplicate content on my website. I’m thinking that i didn’t fix the Yoasts SEO very well. How can i remove them? Please see our guide on how to install and setup Yoast SEO plugin. It will help you properly setup Yoast SEO plugin. The option is moved to the advanced settings pages. Please see our updated guide on setting up Yoast SEO plugin and check step 3 which shows how to enable advanced settings and then step 9 which shows how to enable sitemaps. Yoast seo best way to create a good sitemap for a wordpress blog. Thanks for share it. i already have my sitemap XML , but i need to regenerate it . what is the best way to do that ? Very informative content. It is a good information with good knowledge, my most of doubts get cleared with this. how do you add a sitemap to wordpress.com sites? can you explain, what must be included in sitemaps, whether all posts, category, tags etc..
“Error details: 1 Errors, 0 Warnings. “We encountered an error while trying to access your Sitemap. Please ensure your Sitemap follows our guidelines and can be accessed at the location you provided and then resubmit. First off, I`d like to say “thank you” for all your support and guidance to the new WP users. sitemap.xml has been tested and is working as expected. I understand that in WP Admin, under Search Engine Visibility it is possible to encourage search engines to index the site. My understanding is that doing so will modify the robots.txt file and will allow all robots to crawl my site – including the “bad” crawlers (I`ve read this on other tutorials). Any further assistance will be greatly appreciated. Your Robots.txt file is blocking search engines. You need to change that immediately. Try this and then check again with Google webmaster tools.